BEHIND JAPANESE LINES IN NORTHERN BURMA. Jap artillery was pounding Merrill's Marauders again. Three weeks before. the enemy guns had sent shells whistling into Marauder positions facing the Walawbum garrison. Two weeks before. a Jap battery had ranged in on the Marauders during their attack on the enemy supply route at Inkangahtawng. One week before, a couple of rapid-fire guns had hammered the Marauders all night after their capture of a section of the Shaduzup-Kamaing road. And now Jap artillery was concentrated on a unit of Marauders on Nhpum Ga hill. Another Marauder unit was driving through to relieve the outfit the Japs had surrounded. As the 70-mm shell blasts reverberated through the jungles. Maj. Edwin J. Briggs of La Crande, Oreg., CO of the attacking unit, sent for a mule skinner and offered him a new job. S/Sgt. John A. Acker, the mule skinner, was an ex-mineworker from Bessemer, Ala., who had shipped overseas a year before with a pack howitzer outfit. The outfit had gone to New Guinea. After sitting around for months without going into action, Acker and several others grew restless. When a call was made for animal transportation men to join Merrill's Marauders, they volunteered. That was seven months before. "Acker," said the major, "I understand you and some of the other mule drivers who used to be in the pack artillery would like to fire some howitzers back at these Japs. Is that right?" The Alabaman said it was. "Well, Acker," the major grinned, "this is an emergency. Two 75-mm pack howitzers will be parachuted to us tomorrow. Get two gun crews together and be ready to fire them." Next day an expectant bunch of mule drivers stood on the airdrop field, watching brilliantly colored parachutes drift lazily down. When the "parachutes hit the ground, the mule skinners became artillerymen again. They grabbed the dismantled howitzers and went to work assembling them. The guns were brand new and clean of cosmoline. Within two hours they were assembled, dug in on the airdrop field and firing. A mile away the Marauder unit that was driving through Jap machine-gun positions along the trail to Nhpum Ga heard the shells whistle overhead. "What the hell is that?" one rifleman asked another. "Jap artillery behind us, too?" Then a radio message explained that it was Marauder artillery. Soon infantry-directed fire was blasting the strong 'points holding up the rifle platoon. Two days later Acker and his impromptu artillery crews put their howitzers on mules and climbed the winding trail for three miles. They emplaced their guns on a ridge overlooking the Jap positions between the trapped Marauder unit on Nhpum Ga hill and the attacking unit. While the guns were being set up again T-4 Robert L. Carr of San Luis Obispo, Calif., started for the front as artillery observer with a walkie-talkie. The point platoon had run smack up against one of the strongest Jap positions yet. This was a perimeter atop a little knoll from which Jap machine gunners commanded a clear field of fire for several hundred feet down the trail. The steep sides of the knoll made flanking difficult. It would have to be taken frontally. The point platoon asked for artillery and mortar support. Carr, the observer, took his walkie-talkie up to the first squad. "Jap position approximately 700 yards from guns," he radioed, adding the azimuth. 'Fire a smoke shell, and I'll zero you in." The smoke shell whistled over, followed by a few more as Carr adjusted the firing data. Finally he okayed both range and azimuth. Lacking an aiming circle, the only piece of equipment that was not dropped with the guns, Acker and his men were obliged to use an ordinary infantry compass to gauge azimuth. 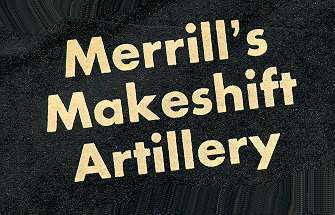 These mule skinners gave up their mules for a pack howitzer when Merrill's Marauders needed artillery. The order came to fire five rounds. Up ahead all morning there had been constant mortar, machine-gun and small-arms fire. But as soon as the howitzers opened fire, Jap bullets began singing over the artillerymen's heads. All day the Japs reminded Acker's men that they were firing practically point-blank at 700 yards. Just after the howitzers fired the five rounds, S/Sgt. Henry E. Hoot of Shepherd, Tex., radioman with the guns, shouted to Acker: "Holy smoke! Some Infantry officer is on the radio. He's excited as hell. Says you're right on the target. "And get this" he wants us to fire 'Battery 100 rounds'." There's no such order in artillery parlance; actually the correct order for a lot of firing is "Fire at will." Acker chuckled at the order. "Okay, boys," he said. "Open those shell cases fast. Gun crews, prepare to fire at will." 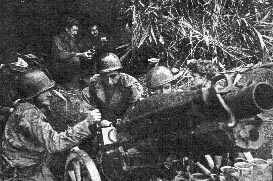 In the Next 15 minutes, the jungle hills rang as the two pack howitzers threw 134 shells into the Jap perimeter. The crews had been a bit slow two days before because they hadn't seen a howitzer in seven months, but now they performed as artillerymen should. Up front the point platoon drove through They found parts of Jap bodies in trees and all over the ground, virtually blown out of their holes. The dense" jungle had become a clearing under the terrific blasting. A platoon leader going through the area, a few minutes after the barrage. discovered two shivering Japs deep in a foxhole, unhurt but moaning with fear. He killed them with a carbine. Apparently they were the only ones who had survived and stayed in the area. The platoon moved through unopposed. For the next few days the artillery worked hand in hand with the point platoon in blasting other Jap positions. On one of these days Pvt. John W. (Red) Seegars of Kershaw, S. C.. walked up to the guns with a broad smile. Seegars had been requested by Acker as No. I man on one of the howitzers but because he was a rifleman and was [deeded in the drive, he had not been sent back to the guns. Now Seegars was wounded in the left arm. "As a rifleman I can't crawl with this arm wound," said Seegars, "so they sent me back to the aid station for evacuation. But I'm not going. I can still pull a howitzer lanyard with my right arm." Acker was glad to get him. MEANWHILE Carr. the artillery observer, found things pretty hot at the front. On an advance with a ride platoon, he was pinned down on the side of a hill by Jap machine guns and grenades at the top. Two men were wounded near him. He left the radio and dragged each of them back through the fire to an aid man. Returning to his radio, Carr egged the Japs into revealing their positions by throwing grenades, thus drawing fire on himself. Then he radioed the howitzers to shorten their range and swing their azimuth until the shells burst near a Jap heavy machine gun 30 yards away. All this time, a Jap dual-purpose antiaircraft gun was throwing 70-mm shells into the midst of the trapped Marauder unit on Nhpum Ga hilt Acker got a liaison plane to spot the ack-ack gun's position. Then the howitzers fired on it all day. At dusk the Jap gun- tried to fire back at the howitzers, but its trajectory was too flat to hit them. The shells either hit an intervening hill or whistled harmlessly high over the artillerymen's heads. And that morning the Marauder attacking unit broke through to relieve the unit that had been cut off by the Japs for 10 days. Acker and his men, mule skinners no more, fired a salvo to celebrate.